Hi there, I have a 2005 trx300ex that decided to lock up on me last fall. So I spent the winter tearing it apart slowly and rebuilding it in my spare time. 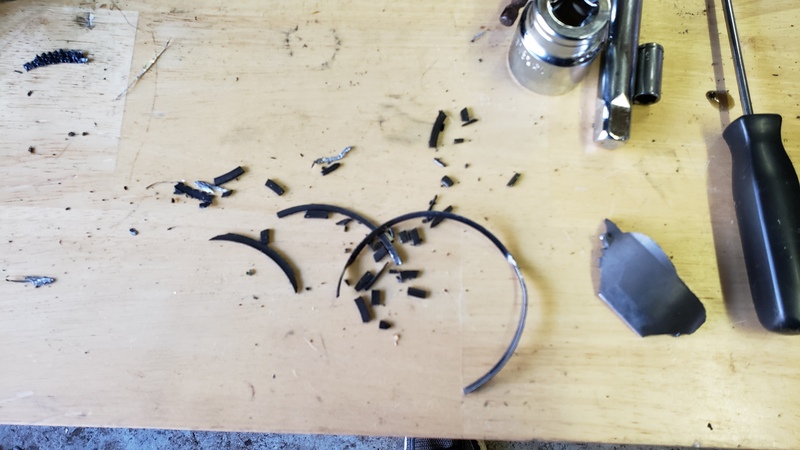 I found out that the piston rings decided to blow apart and lock the piston in the cylinder destroying the sleeve in the process. Since I cant leave anything stock I decided that a upgrade was in order so I ordered a 330 big bore cylinder for it with a hotshots cam(1058-1). I ended up splitting the case to clean it completely out and started to put it back together. I almost have it together now but I've run into a issue.....when I bench shift the trans I can get it to shift into 1st,2nd,3rd and reverse. It will not shift into 4th. The trans worked just fine before I took it all apart even after the motor quit. Does anyone know what I may have fudged up or is this normal till the motor runs? 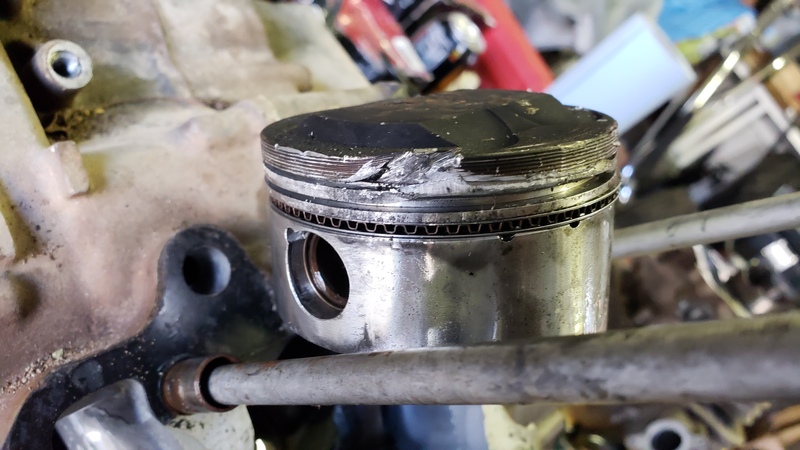 wow..you did a number on that piston !..lol. as for why it wont change gears ?, my money say's you did not install the transmission right ?. maybe a gear on wrong ?, shift fork not right ?, bad spot in the shift drum ?. 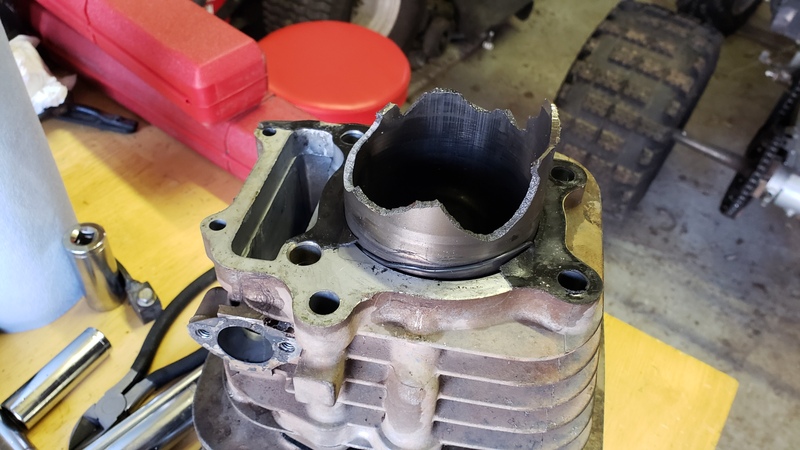 yeah, its best to rip it back apart, and have a look before you put the motor back in the frame, now's the time to do this..not after you put the motor back in !..lol. did you inspect the crank ?. the wrist pin and lower end area needs to be checked !. So I got it back together after blowing it apart again and fixed trans issue. Now I'm thinking that my ignition control module is shot. I have no spark at the plug. After some wire chasing I figured out that I have a signal going into the box but no signal coming out to the coil. My question is first of all am I right in thinking its shot and if so is it worth looking for a upgraded one to complement the other upgrades? Was also thinking about a upgraded coil, any ideas on a good one? Never mind, I'm an idiot. The damn kill switch was on, lol. Its runs but it almost sounds like the timing chain is loose. I had to put a new chain on it with the rebuilt as I had to cut it off when i tore it down so i highly doubt that it is stretched. How often does the tensioner go out on these quads? Any way to tell if its bad? your not the first, and wont be the last to '' forget '' the kill switch !..lol. remove the tensioner, let it extend, stick back in like your gonna bolt it up, your looking for about 1/2 before you reach cylinder. and it should lock once it extends. right chain on it ?. how was the chain guides ?. was everything installed right ?.